This charming Parisian building is situated in a very quiet street, just minutes away from the Hôtel des Invalides. Located on the Left Bank in one of the most artistic and intellectual quarters of Paris, the St Germain Apartments are surrounded by shops, theatres, well-known restaurants, museums and monuments. 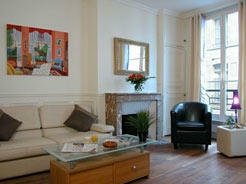 It is also close to the business district and to some of Paris' main attractions. The apartments have been completely renovated to very high standard in elegant Parisian style.